A member of a rescue team searches for victims of a collapsed tailings dam owned by Brazilian mining company Vale SA, in Brumadinho, Brazil, Feb. 10, 2019. 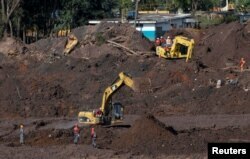 Members of a rescue team search for victims of a collapsed tailings dam owned by Brazilian mining company Vale SA, in Brumadinho, Brazil, Feb. 10, 2019. 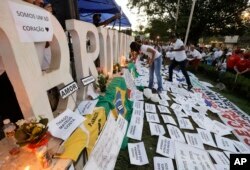 Friends and relatives light candles during a march paying homage to the victims of a mining dam collapse a week ago, in Brumadinho, Brazil, Feb. 1, 2019.